Of all the things in the human heart, anger can be one of the most intense, destructive, and unhealthy emotions that we can experience. If not handled in the proper way, it can have drastic life-changing consequences. Anger may be caused by pressures of work, family or even from being the innocent victim of another’s wrong-doing. Left unresolved, anger creates an intense desire to destroy something. Regardless of the reason for anger, the Bible has answers on what causes anger, examples of good (righteous) and bad (unrighteous) anger and how we should deal with it as Christians. Our earnest prayer should be that God changes our heart as we allow Him to mold us into a vessel fit to carry His gospel to the world. Take a look at these twenty Scripture quotes that talk about anger. Don’t forget to enjoy the video to the right “Change My Heart Oh God”. Psalms 7:11 (KJV) God judgeth the righteous, and God is angry with the wicked every day. 1 Kings 11:9,10 And the LORD was angry with Solomon, because his heart had turned away from the LORD, the God of Israel, who had appeared to him twice and had commanded him concerning this thing, that he should not go after other gods. But he did not keep what the LORD commanded. 2 Kings 17:18 Therefore the LORD was very angry with Israel and removed them out of his sight. None was left but the tribe of Judah only. Mark 3:4,5 And he [Jesus] said to them, “Is it lawful on the Sabbath to do good or to do harm, to save life or to kill?” But they were silent. And he looked around at them with anger, grieved at their hardness of heart, and said to the man, “Stretch out your hand.” He stretched it out, and his hand was restored. Genesis 4:5-8 but for Cain and his offering he [the LORD] had no regard. So Cain was very angry, and his face fell. The LORD said to Cain, “Why are you angry, and why has your face fallen? If you do well, will you not be accepted? And if you do not do well, sin is crouching at the door. Its desire is for you, but you must rule over it.” Cain spoke to Abel his brother. And when they were in the field, Cain rose up against his brother Abel and killed him. Proverbs 30:33 For pressing milk produces curds, pressing the nose produces blood, and pressing anger produces strife. Proverbs 14:16,17 (KJV) A wise man feareth, and departeth from evil: but the fool rageth, and is confident. He that is soon angry dealeth foolishly: and a man of wicked devices is hated. 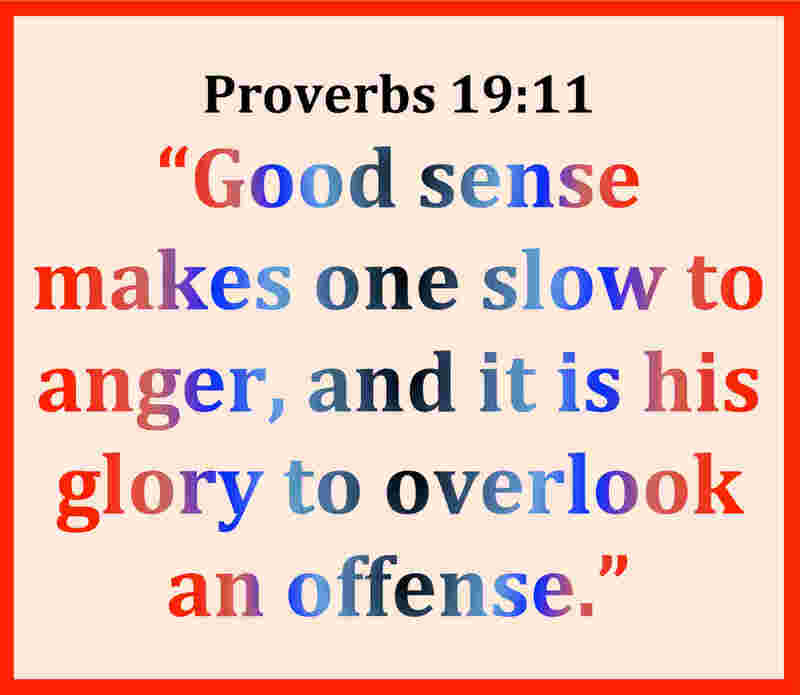 James 1:19,20 Know this, my beloved brothers: let every person be quick to hear, slow to speak, slow to anger; for the anger of man does not produce the righteousness of God. Galatians 5:19-21 Now the works of the flesh are evident: sexual immorality, impurity, sensuality, idolatry, sorcery, enmity, strife, jealousy, fits of anger, rivalries, dissensions, divisions, envy, drunkenness, orgies, and things like these. I warn you, as I warned you before, that those who do such things will not inherit the kingdom of God. Galatians 5:22-25 But the fruit of the Spirit is love, joy, peace, patience, kindness, goodness, faithfulness, gentleness, self-control; against such things there is no law. And those who belong to Christ Jesus have crucified the flesh with its passions and desires. If we live by the Spirit, let us also walk by the Spirit. Ephesians 4:26-28 Be angry and do not sin; do not let the sun go down on your anger, and give no opportunity to the devil. Let the thief no longer steal, but rather let him labor, doing honest work with his own hands, so that he may have something to share with anyone in need. Colossians 3:8, 12-13 But now you must put them all away: anger, wrath, malice, slander, and obscene talk from your mouth. Put on then, as God’s chosen ones, holy and beloved, compassionate hearts, kindness, humility, meekness, and patience, bearing with one another and, if one has a complaint against another, forgiving each other; as the Lord has forgiven you, so you also must forgive. Can A Christian Be Angry and Not Sin? Read this article about Christians being angry. Do Christians have a right to be angry? Is it biblical? 20 Bible Verses About Friendship– How should you treat your friends? What does the Bible say about choosing friends? Read these great scripture quotes. Superb again my dear friend and fellow co-heir in Christ. I can see that you have such a heart for God and that shows in your writing and it overflows from your heart. May God richly bless you my beloved sister, friend, and co-heir in Christ. I can’t wait to meet you some day at the great Marriage Supper of the Lamb of God. Save me a seat next to you. So glad you enjoyed the topic Jenn. Feel free to stop by often to WCWTK as we post something new every day! Blessing to you. My son has a problem with his anger. I hope some of this will help him. Thanks so much for having this page! Hi Joy, It is my pleasure to share the Word of God in this way. I will pray for your son. This website provides me with some quotes and bible-verses related to anger, yet I don’t know what to do practically since I don’t even know where my anger comes from. But the opening lines mentioned that anger can come from certain pressures. I have those indeed. I hope I can deal with it properly so that I won’t let it destroy parts of my life so dear to me. Hello Oscar, Thank you for taking the time to comment on this article. It is true there are always roots to the anger that we experience. It is very important to identify the things that lead to anger. Might I suggest that you try to find a pastor or a Biblical Counselor in your area that can help you to identify and work through the roots that cause your anger? You may email me at “contact@selahmountain.com” and I will help find someone in your area to help you. In the context it does say “be angry and do not sin”. What this means is that there are things that we may be “righteously” angry about, however that anger should never lead us to sin. We must deal with anger in an unsinful way because when we do not, we give Satan opportunities to use us to do sinful things. See how the passage continues with an example: Don’t steal anymore, instead work honestly and then with the wage that you earn, give to someone in need. Again, thanks for stopping by, visit again soon! I have been dealing with anger towards my husband of 11 years due to his alchoholism. Reading this this morning has given me great comfort & reminded me to not have such a short temper. Thank you &God Bless. I am Feeling Stressed,Hurt,an Sometimes angry,I lose control,Then later very sorry,for how I handle all.But I am daily lied to,used,Feel mistreated,By my son an his girlfriend,,Which I totally keep them off the streets,I have kidney cancer,,COPD,Now doing bio,of my thyroid,to see if that cancer,I ask GOD’s help all day long,,He does help,Thank Him for this,How much should a person take,or be able to handle? I forgive them,feel stuck,an confused,Do I put them on the streets again,That’s wrong I know,,HELP PLEASE!! A Mother’s cry,,I Love the Lord,am Thankful for each day He gives me here,How much should I allow to be in my life?? When considering your anger Mary, you must put God first and ask for guidance. Also, keep your health in your mind because you can become more ill if you fail to focus on the right things. I think you would benefit from focusing on the Word and get some counseling because you are dealing with a lot. Also look into natural remedies to help like chamomile tea etc. Get a good relaxation regime. Things work out in God’s time and God’s way! Thank you for this article. I will be reading a lot more from this website. I struggle a lot with anger and i have discover that it ruins everything i do every decision i make and affects everyone around me. I really need to change and need help overcoming my anger towards life, my family, myself. Thank you. My ex-Husband molested my two girls, I have so much hatred and anger towards him. He is still free because he has been running from police.I want him to pay for what he did. Is this anger just ? or will I also be judged because of my feelings towards a man who hurt my little girls? I am so sorry to hear about the pain you and your family have gone through. Abuse, breaking of trust, betrayal, divorce and everything in between. I can tell you, from my own experiences, that the anger is just. Also, people will judge all sorts of things whether they have the right to or not. If you are a Christ follower, you can be assured that he will pay the full price for his sin if he does not turn his life over to Christ and His authority. The hardest part of all of this situation will be for you and your girls. 1, to grieve what has been taken, 2, to recover from the loss, 3, to stand up, with Christ’s help, knowing that it is only with His help you can move forward from this, 4, and this will be the hardest part, to forgive him for his actions. know that this last part is not freeing him to do it again, nor is it allowing him to hurt you and your girls again. It is instead, freeing you from the captivity and poison of unforgiveness, thereby keeping you in chains to a life God never intended you to live. Know that He was devastated by the choice your ex made and it hurt Him so much to feel and see everything you and your girls went through and will go through. Even still He will be faithful and will NEVER leave you or forsake you! He will also be able to use all of it for His glory. Trust Him Eval. With much love and prayer. I do indeed suffer from a lot of anger so i needed to hear a few friendly words from the man above on the subject. I would like you to know that I found this website very interesting and it gives enlightenment to all Christian like me. Specially now that I am being trained to be a full blown leader. I hope you don’t mind and the rest of the writers here that I used some of your articles for my Lectures and Devotion. More Power and continue to be a blessing to others. I will keep you in my prayers Janet. I will pray that hour husband’s heart is softened to listen when you need him to. I just came across this article after googling “biblical answers to anger”. I feel as my life is upside down; at 31 yrs old, I sometimes feel I can no longer survive. Life has taken a tole and left me in a world of hurt! Your article really helped me and I will continue reading and ask if you remember, please say a pray for me. Thank you! Thank you so much for this reference. A friend just asked me to pray for him due to being angry about a recent situation and aside from praying for him, I also sent him a few of the scriptures quotes on anger. Very helpful! May God continue to bless your ministry! Thank you and God Bless you for the work you are doing. I use your words of wisdom in my Christian Coaching ministry. It is so sad that the doctrine of what we speak and what our anger affects isnt’ taught more in the church. Too many Christians are speaking death unto others and hindering God’s blessings in their own life. I continue to be blessed by all who share through comments. Know that I thank God for you and if you have requested prayer I have lifted your request on high. This is the first time I read your article and quotes. This shows just how much God would love for us to be richly blessed by fellow Christians. He is using His own children to be instruments to speak truth in love. I am about to counsel a woman who is filled with anxiety. Am sure I could use what I have learned from this today. Janet and /candace, you will be in my prayers. May the loving Hands of our merciful Creator tranform your hearts to be filled with His goodness. Let us all surrender our all to God. Trust Him completely. All glory goes to God Esperanza and thank you for the words of encouragement. Thankyou so much for this!! I really mean it!! At my school my friends and I started a bible study called RFC and its my turn to speak and I really do thankyou for helping me out with this! I want 2 really tank God 4 what u are doing on line, God will reward u. Pls i want 2 know what is really de cause of anger, is it in de system? Is it natural? my girlfriend has a problem with her anger and we are far from each other. every time do things she get easily angry. can you help me in this situation? I just wanted to say thank you for this message about Anger as how to deal with it as Christians , I have learnt a lot after reading the article and the scripture , I have developed confidence to teacher other youth at my age about Anger according to the bible. This article about anger is revealing and worth reading. God bless the writer and people that made available on net. I SHOULD HAVE KNOWN YOU ALL WOULD BE THE ONES WHO WROTE ABOUT THIS AS IF YOU’D KNOW I WOULD NEED IT SOME DAY . GOD IS GREAT HE HAS US IN MIND BEFORE WE EVEN ASK , I OVER-DO ALOT ON THINGS TO TRY AND MAKE A POINT THAT I AM GOING TO BE RIGHT ABOUT SOMETHING , AND IT TURNS OUT TO BE AN OVER-DO SOMETIMES , I DON’T KNOW IF YOU EVEN UNDERSTAND WHAT I AM SAYING , BUT GOD KNOWS . I JUST TRY TOO HARD SOMETIME , AND MAYBE I DIDN’T PRAY ABOUT HOW TO HANDLE A SITUATION AS I SHOULD HAVE . I KNOW THIS , GOD KNOWS ALL , ALL THE TIME , AND I AM JUST GOING TO HAVE TO LET HIM SPEAK TO ME , IN THE ONLY WAY I KNOW HOW THROUGH PRAYING AND THROUGH HIS WORD !! Angry morning. Googled scriptures on anger and found this. Definitely some powerful scriptures and quotes. Thanks. Now I can calmy study for finals without the frustration. It all starts in the heart. This is some good fruit. MY WIFE IS GOING THROUGH SO MUCH , I ENCOURAGE HER TO JUST READ THE BIBLE , AND GET DEEP INTO IT , THAT IT IS LIKE MEDICINE WITH THE MOST AND BEST OF POWER , PLEASE PRAY FOR HER , I KNOW I ASK FOR PRAYER ALOT , BUT I KNOW IT MAKES A DIFFERENCE , AND I LOVE HER !!!!!!! THIS AS B ABOVE SAYS GOOD FRUIT FOR SURE !!!!!!!!!!!! Thanks!! The holy ghost rejoiced in me when I read these. Thank you for this article. I had a rough patch this past year and I’m working through it with counseling but there are times when I get angry and I see saw from being able to defend myself from the negative to being a doormat, or worse being a straight “B”. I just thank God every day for the people who have been there for no other reason than that they love me and want the best for me and they believe in me. There are times when you don’t know what to do or who to trust but believe in God and have faith! Hello Rhonda and thank you for your comment. I don’t know what else to tell you but the Psalms, like Psalm 37 are really very good at times like you are enduring. I will also pray for his salvation and for him to repent, confess his sins, and put his trust in God. Only God can change this man’s heart (Prov 21:1) and so that’s what we can pray for Rhonda. Maybe God is waiting for him to hit rock bottom and then and only then will he see his need for God. I am sorry for such a severe trial for you. to Rhonda from another reader , whispering a prayer for you right now ! Hi, Ive been through a rough patch for a year and a half and been through councelling and even had to take time away frm my course of study. Ive been struggling with intense anger and bitterness for so long its disrupting my life. Reading this article does help but surrenderring to God requires so much effort because I was innocently accussed of so many things n slandered upon by my own closest friend and then hv my ex partner side her n go against me too and in the end be with her. She used all the things she knew about me against me and did all the things she told me she wouldnt do. now im the only one suffering. and the anger eats me up daily til the point i lose function. Please keep me in prayer. Is it that it says we can be angry but do not lash out in fits of rage? 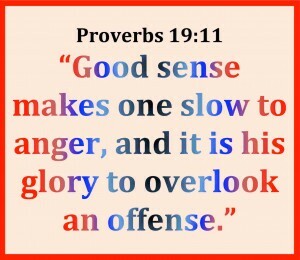 that the solution of anger would be self control? because struggling so harddd to not take action of all the revenge plotted in my head in anger, and not to lash out in my full anger towards her and my ex partner. but im imploding inside. Some time ago God revealed to me an anger problem in my life, so he gave me Psalm 37:8 and revealed to me 3 steps to murder. anger, wrath, and agitation. we may not shoot someone in anger but i to often have fired death or injury words. I am asking the lord to continue to energize my will to obey his word and be not angry. Thanks for your message. The lord bless you the more. You are very honest but yet, encouraging. Many are in this struggle my friend. I will pray for you Windle and may God richly bless you. I’m a 1st grade teacher and you know kids, sometimes they really use the very last of your patience especially when things just started piling up. These past days, it feels like I was really being tested in these two, and it has been a struggle for me. But God is just so amazing that when you’re getting off tracked, He is there to remind you —- oops! Patience. The thing that strucked me? It’s my non-Christian boyfriend who told me, “Love your students.” I do love my kids.